Tobacco Use Surges Among Young People, Triggered by E-Cigarettes - 24/7 Wall St.
Around 4.9 million middle and high school students used tobacco in 2018. That is up from 3.6 million in 2017, a 36% increase. Virtually the entire increase was due to e-cigarette use. There were sharp differences in tobacco use by racial or ethnic background. 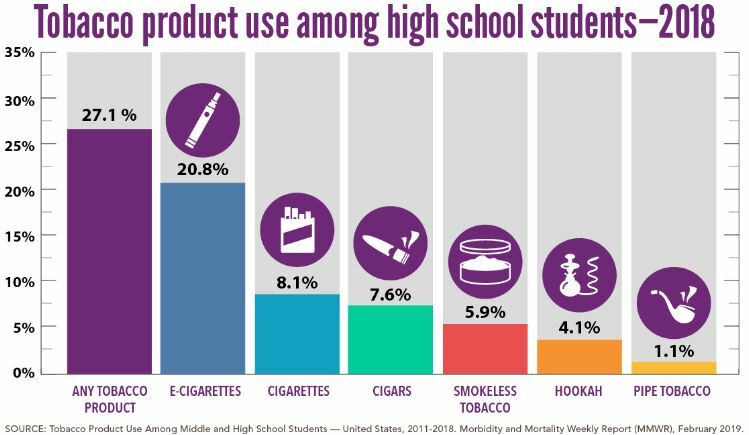 Across high school student users in 2018, any tobacco product use was reported at 32.4% for non-Hispanic whites. The figure dropped to 21.7% of Hispanics and was down to 18.4% of non-Hispanic other race. At the bottom of the list, 17.4% of non-Hispanic black students were tobacco users. Across middle school students last year, any tobacco product use was reported among 9.5% of Hispanics and 6.8% of non-Hispanic blacks, and it dropped to 6.6% of non-Hispanic whites and dropped again to 3.8% of non-Hispanic students of other races. State officials already have started to regulate e-cigarette use among young people. Every state except Michigan has laws that post the minimum age for use. All are between 18 and 21 years of age, according to the Public Health Law Center. The FDA also has begun to regulate e-cigarette manufacturing the same way it regulates more traditional tobacco products. The e-cigarette market has become attractive to traditional tobacco companies. This is because of the sharp rise in the use of the products. ResearchAndMarkets.com has estimated the global market for e-cigarettes will hit over $44 billion in 2023. E-cigarette maker Juul recently got a $12.8 billion investment from cigarette giant Altria. In return, Altria got 35% of Juul.